This page includes The Club News columns from the 2002 issues of Across the Fence Post. The WPHS is offering its newest publication titled "The History and Postal History of the Two USS Wisconsin's. " The 52-page booklet contains information compiled by Thomas Becher of Stratford, WI. Frank Moertl of Hartland, WI, edits it. The booklet includes the history of the original battleship launched in 1898 and the second ship launched in 1943. It depicts postal history items with USS Wisconsin cancels, ship post office documents, commissioning and recommissioning programs, and various photos. Schmidt, Treas., WPHS, 1978 Fox Burrow Ct., Neenah, WI 54956, 920-722-1449, gschmidt@vbe.com. The Milwaukee Philatelic Society's annual spring bourse, STAMPFEST, will be held March 2-3 at St. Aloysius Gonzaga Hall, 1435 So. 92nd St., in West Allis. This year's event features 25 dealers from throughout the Mid-west. MPS is offering hourly door prizes. More details can be found in the ad on this issue's back page. For further information, contact: Roger J. Szymanski, P.O. Box 1980, Milwaukee, WI 53201-1980,414-744-6640. Milwaukee-area clubs will hold their 16th annual Distinguished Philatelist Appreciation Dinner on March 17, 2002. Moraine Coin and Stamp Club, Wauwatosa Philatelic Society, and American Topical Association Chapter V. Claude will be honored for visibly and repeatedly demonstrating an interest in stamp collecting as well as working to develop interest and, enjoyment of the hobby for others. The American Air Mail Society, General Billy Mitchell Chapter, with Fay Heller chairing the Advisory Committee, hosts the 2002 event. Meetings are now being held the second Thursday of each month at 7 p.m. at the Monroe Middle School, 1510 13th Street, Monroe, WI (use south/back door entrance). For further information, contact Earl Button of Monroe. His daytime phone is 608-328-8960, evenings 608-328-2827, e-mail button@nscdatacenter.com. The MILCOPEX '02 prospectus and exhibit entry form is available from: Robert Henak, P.O. Box 170832, Milwaukee, WI 53217-0832, phone 414-351-1519, e-mail henak@acompuserve.com. MILCOPEX, sponsored by the Milwaukee Philatelic Society, is an open show and Wisconsin's only American Philatelic Society World Series of Philately exhibition. This year's show will be held at a new location: the Wisconsin Products Pavilion (formerly Trade Mart Building) at the Wisconsin State Fair Park, Milwaukee/West Allis. Each year the RSC presents the Perry Arnquist Award to one of its members in recognition of outstanding club service. The 2002 award went to Craig Edgington, who has served as the club's vice president and president. He is the current newsletter editor. TRI-PEX STAMP FAIR 2002 will be held June 22-23 at St. Aloysius Gonzaga Hall, 1435 So. 92nd St., West Allis. Hours are 10 a.m. to 5 p.m. on Saturday and 10 a.m. to 4 p.m. on Sunday. The Polish American Stamp Club, Italian American Stamp Cub, and the North Shore Philatelic Society of Milwaukee sponsor the annual bourse. As of May 1, the SSC will meet at Maple Lanes (bowling alley), 3017 So. Business Dr., Sheboygan, WI. The SSC meets the first and third Wednesday of each month at 7:30 p.m. The MSPC is planning to sponsor a fall show with October 12 as a tentative date. Details to follow. The KMCSC has produced an Allenton, WI, ZIP code day cover. Allenton's ZIP code is 53002 and the cover is postmarked May 30, 2002 (5-30-02). The colored cachet features the Allenton Post Office. Covers may be purchased by sending $1.50 each and an SASE to: KMCSC, P.O. Box 361, West Bend, WI 53095. 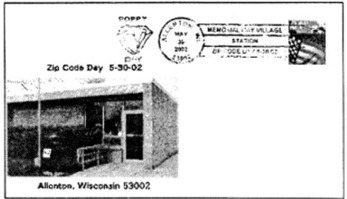 The Walworth County (WI) Stamp Club was founded in November 1968. It disbanded in December 2000. Throughout the years 1970-2000, the group sponsored an annual stamp show (WALCOPEX). It also hosted the 1973 WFSC convention and exhibition. Collector Daniel Hammell is preparing an exhibit of WCSC covers for a permanent display at the Elkhorn Historical Society. If you can help with material for this exhibit, contact: Daniel Hammell, 1227 Moore St., Beloit, WI 53511. 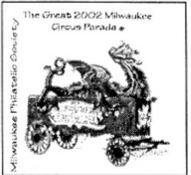 "The Golden Age of Chivalry" circus wagon is featured on the multicolored cachet of MPS's 2002 circus parade covers. They were prepared for four days of the parade celebration and include a pictorial cancel depicting two camels. The celebration was held July 10-14 at Milwaukee's lakefront Veterans Park showground’s. MPS has issued circus parade covers for each year 1971-73 and 1985-2002. Cost of a single 2002 cover is $2. A set of four is $6. Send orders to: MPS Circus Covers, P.O. Box 1980, Milwaukee, WI 53201-1980. Make checks payable to MPS and include a No. 10 SASE. DANEPEX '03, sponsored by the Badger Stamp Club in Madison, WI, will accept exhibit entries from all WFSC club members. DANEPEX has been held annually since 1990, but in the past, only BSC members were allowed to enter exhibits. Entries for single-frame exhibit competition are especially encouraged. A best single-frame and applicable special awards will be offered. DANEPEX . '03 will be held April 5. The show uses 16-page frames and certified WFSC judges. Deadline for entries is March 1, 2003, with entries accepted on a first-come, first-served basis as space allows. For a prospectus and entry form, contact: Charles Shoemaker, 209 Shiloh Dr., Madison, WI 53705; e-mail kenjico@chorus.net. 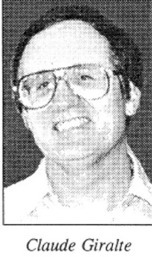 Frank Garniss received the 2001 Jack Larsen Memorial Award. The award honors the club's member of the year. Dealer Dave Carney, who recently moved to Kimberly, WI, has organized a monthly Fox Cities-area stamp bourse. The bourse will be held the second Sunday of each month beginning on October 13, 2002. Other 2002 dates are November 10 and December 8. The four-dealer bourse will be held in Darboy, WI, at the Buchanan Town Hall, N178 County Road N (on the east side of the road between County Highways CE and KK). Hours are 10 a.m. to 4 p.m.
For further information, contact Dave at P.O. Box 55, Kimberly, WI 54136-0055; phone 920-687-5677. MILCOPEX '02, sponsored by the Milwaukee Philatelic Society, was held September 20-22 at State Fair Park in West Allis. Congratulations to the exhibitors listed below. All are Wisconsin residents except for Tim and Adam Wait, who live in Illinois and hold membership in the Rockford Stamp Club, one of our out-of-state WFSC member clubs. MILCOPEX is Wisconsin's only national-level show.